There were three participants, Kin, Jack and Toby, and they were great. I mean, any old weirdo could have signed up, but these weirdos were fun, nice, easy-going and really into training. We all got along easily from day one and ended up hanging out even when we weren’t playing badminton. 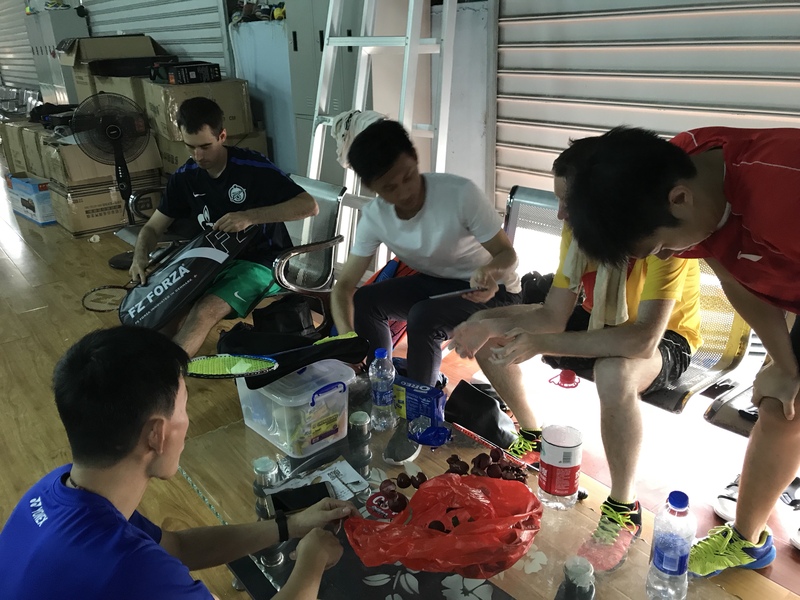 We would take a break halfway through training and my coach would often bring out a snack like some fresh lychee which he chilled in the cooler. They really liked the courts. Initially they were surprised at the casual feeling of the courts. People come in all times of the day and just watch badminton, or sit and chat with each other or whatever. 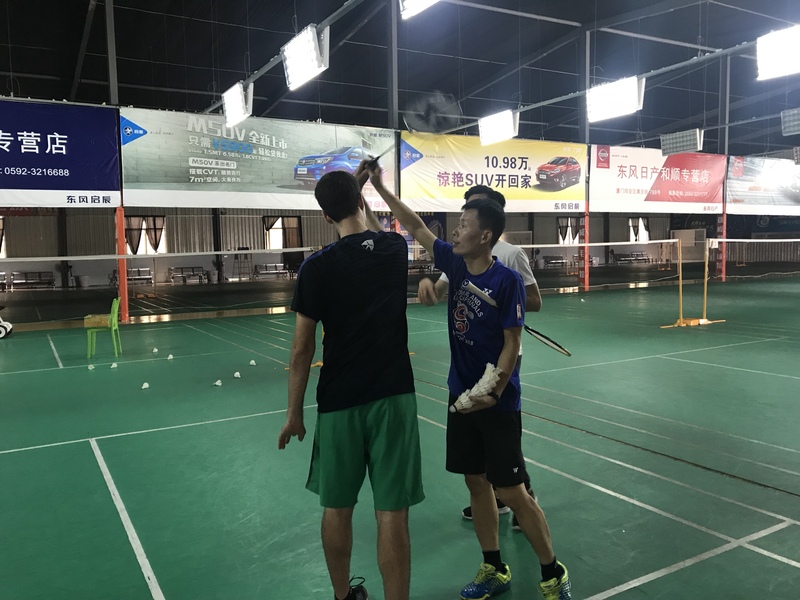 Since the courts are literally open all day, and my coach and Lao Zhang Ge (the old guy who sits at the desk) are always there, there is always someone to talk to and people with a short break from work often come in and hang out for a bit. And they loved my coach, and he loved them. The first day was a bit formal (and my coach kept forgetting their names. Like Chinese names are hard for foreigners, English names are hard for him. He kept whispering to me “what’s his name again?” as he couldn’t remember the pronunciation) but soon after they were best buddies. Most conversations had to happen through the translator since two of the guys couldn’t speak much Chinese, but you don’t need to speak the same language to be able to convey friendship and training was more fun because of the camaraderie between them. And they liked his coaching style too! They liked not only his technique, but the way he explained everything and the reason behind things. Honestly, that was the most gratifying part for me. I love my coach and think he’s the best but you never really know if it is because the coach is good or because you just click for some unknown reason. Having these three guys all give rave reviews about my coach made me feel like a proud mama. After the first few nights I stopped going to night play because I was just too tired. I was still tutoring and doing some other things in the afternoon so I couldn’t rest as much as they could, and I’m like 10 years older than most of them, and I can play there anytime, not just this week, and….Well, perhaps I should just admit defeat gracefully. They outplayed me. It really could not have gone better. But don’t take my word for it, check out a little video recap I made of our week. Now the big question…will I do it again? To be honest it was a lot more work than I had anticipated and these guys were all easy going and competent (they found their way on the buses and arranged dinners and called taxi’s themselves). If they were needy at all it would have been a lot more work. I was also kinda stressed all week that something bad would happen and they would get hurt or lost (just my own paranoia, not because of anything they did) so I had trouble sleeping and when I did I had weird dreams. I might do 2 sessions because there were several people that wanted to come but couldn’t make that specific week, so perhaps next summer I’ll do two different week-long slots? Anyway, I need a long rest before thinking about it seriously (and I have a year to do it) but if this is something that interests you please let me know. 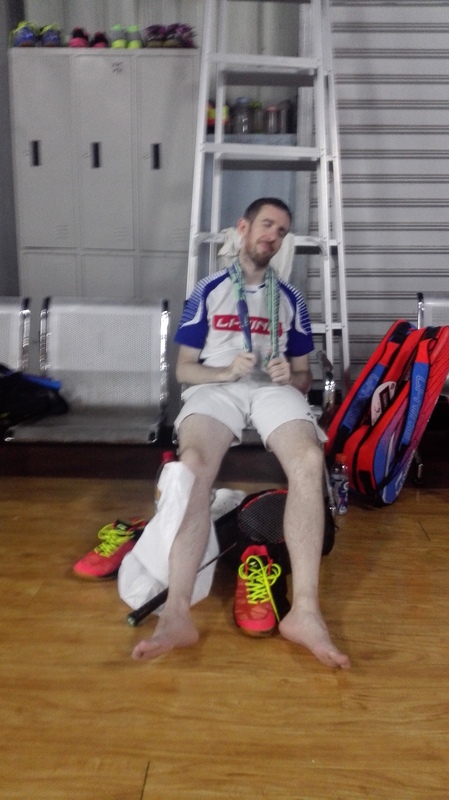 Kudos to you hosting the event, i’ve followed you from Badminton Central and it really is great to see that this camp took off and looked so great! I am really interested to join next year if you’ll be organising one in 2019, i wasn’t able to get myself going to this one as I’ve just been going through a big career change, looking foward to see more news from you! Awesome! I’ll have the final plan in January so there will be plenty of time to plan for it! In Xiamen China! I’ll announce the next training camp sometime in January (for summer 2019). Hope you can join! 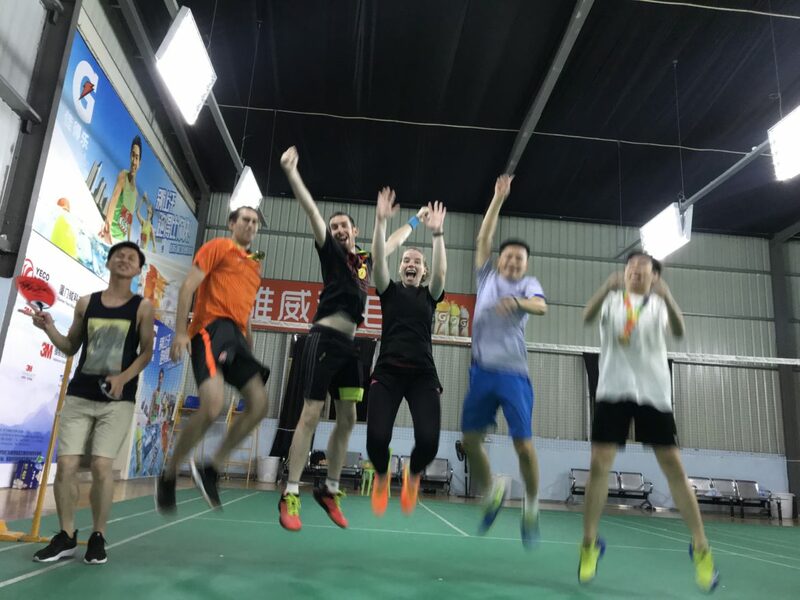 It was a great 2018 to see your videos and wish you have a wonderful 2019 ahead playing more fun badminton! Okay! I will get it up shortly! I wld like to know more esp the possibility of having a session in March 2019. Sure, you can email me and I can give you the details.